In the most recent issue of House Beautiful, the magazine has given the readers a list of sixteen “recession proof” sofas, all priced under $1999. Their lowest priced sofa is $899. Although the article was quite helpful, unfortunately it isn’t for those of us for which a purchase of under $1999 could be more than a single paycheck! Additionally, if you’re anything like me or have lived in small urban apartments, a sofa is typically out of the question because they are much too big. So below, I have given my top five choices for truly affordable loveseats. Starting with the most expensive on my list, the Regent Loveseat from Target, costs $929. I love the sloping arms and the chic pewter color. The lines are both modern and traditional. 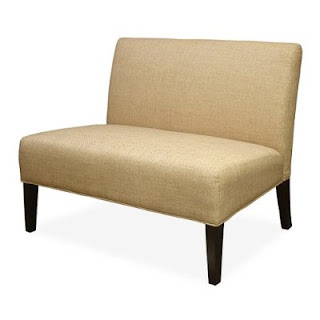 Next, and perhaps my favorite, is the Nate Berkus Studio Sofa, available from HSN.com. This sofa has beautiful turned wood legs on casters, which give it a very traditional feel. It comes in a variety of colors and patterns, and at just $499, its a steal–I am partial to this pool color above. And remember, one of the best parts about HSN.com is that you can pay in installments! The more I look at this sofa, the more it grows on me. 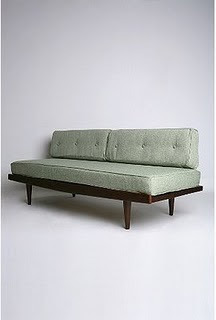 This is the Mid-Century Sofa from Urban Outfitters. 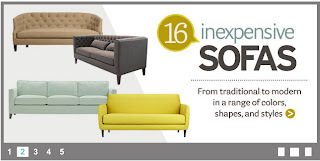 It is the largest on this list, at 75″ long, however, at $480, you are getting a lot of sofa for your money. For those of you who might not like the dark wood, this is easily lacquered (love it) in another color! The best part is, you can remove the back cushions and the sofa becomes a twin bed! 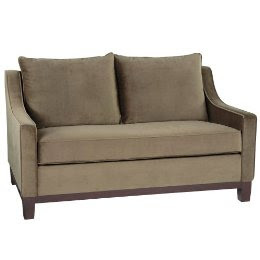 So although a little larger than the others on my list, this sofa can also serve as your guest room–a great value. Gotta love ikea. This is the Karlstad loveseat, which comes in at $379. 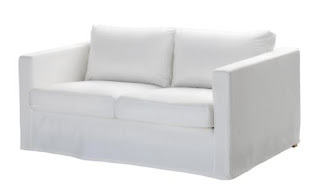 I love the clean modern lines of this sofa, it is a total blank canvas. It would work with any decorating scheme, and in fact should probably come with a tag phrase–just add throw pillows! This little sofa is the Dolce Loveseat from Target. 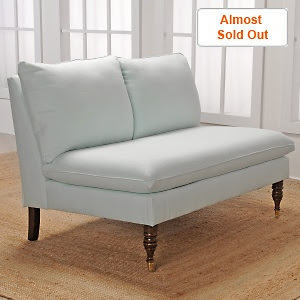 At just $279.99, this little loveseat will fit just about anywhere into any decorating scheme, again, with some throw pillows. I thought this might look great at the foot of a bed or perhaps even as a dining banquette. The possibilities are endless! Please head to the newsstands or check out HouseBeautiful.com for their list of affordable sofas, it truly is a great assemblage. Obsessed with the Nate sofa! I actually ordered his mirrored tray from HSN! ha I never thought I would see the day. When I think of HSN I’m bombarded with images of Tanzanite Jewels! Olivia, this is a brilliant list. I think Nate’s is my favorite but I’m with you on ikea’s and the last one from Target too.